This week we celebrate Veteran's Day. There are so many amazing men and women who have served our country to keep us safe and they deserve our respect and sincere displays of appreciation. They took Action when they were called and now it's our turn to show them our real, sincere appreciation. Doing this can be done in very substantive ways that provide real assistance to our Vets. I am saddened by the massive campaign going on this year by Wal-Mart that is just empty platitudes and in fact is actually detrimental to many vets. They have a massive campaign to change one light on your house. I strongly object to this campaign and called Wal-Mart directly with my objections to it. (not going in to my full objections here because that is not the point of this post. If anyone wants to discuss it with me directly just let me know. I'm happy to talk about it just not blog about it.). I have never felt more dismissed by anyone ever. My call was met with an OK by the person on the other end of the phone and that was it. No follow up email saying thank you for taking your time to call or anything(!!!) not even any explanation on the phone call about their policy on taking calls like mine. I might as well have been talking to the wall. This year I am fully boycotting Wal-Mart for all purchases. I began with Halloween and drove by Wal-Mart to spend $100 on Halloween candy at the next available store. I have been a loyal Wal-Mart shopper. I have even slept in a Wal-Mart parking lot! (Yes you can do that - Most, but not all, Wal-Marts welcome overnight parking of camper trailers and Semitrucks. You will often find a section of the parking lot where that is allowed). In the past I have appreciated what Wal-Mart has done for our Vets but this new campaign of theirs is so all kinds of wrong. Veterans do need our help and they do need to know that we care. 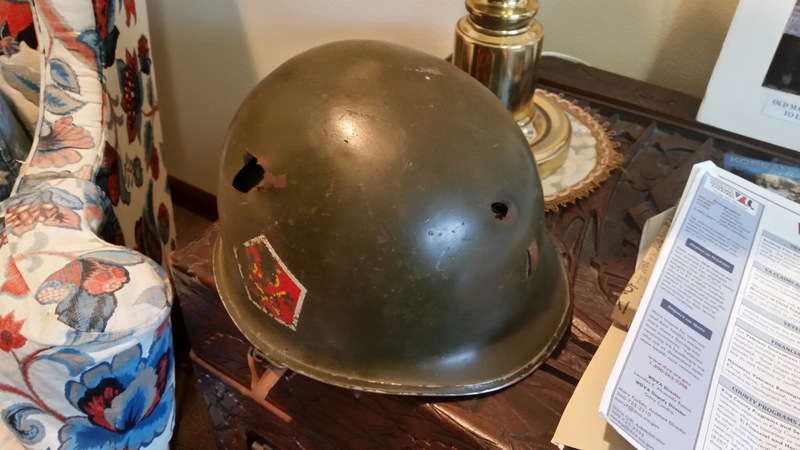 - Veterans like my Father-in-Law who proudly displays the helmet with a bullet hole in it that he wore in the Korean War. 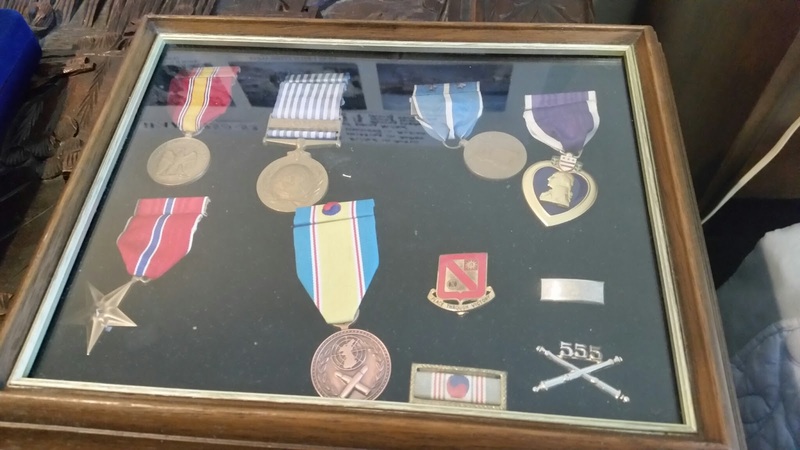 - Veterans like my Father who served out his time in peace time and is too humble to accept any benefits because he doesn't think he deserves them. 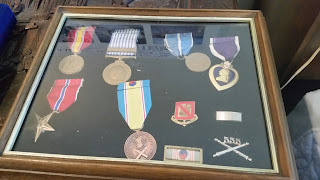 - Veteran families like my friends who have gone through divorces because of the trauma brought about by what they have had to bring home with them. The scars are not always visible. - And of course those Veterans whose scars are not only visible but deep. 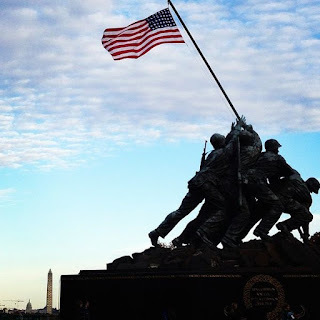 - The Veterans who rely on a failing VA system. - The Veterans who feel that suicide is the only way out. A single light on our front porch doesn't do anything for these Vets - many of them won't even realize they are being honored by this terrible color choice. In every town across the US there is a VFW Hall or Veterans Memorial or some other Veterans group that would be happy to take the cost of one lightbulb and put it toward their very valuable programs that they provide to your local vets. If your town does have a Veterans Memorial take your family, some garden gloves, and some trash bags and help clean up the area. It doesn't have to be an organized city event although many cities do this very activity every Veterans Day to show they care. Visit a Veterans Hospital and visit some of the Vets that are taking visitors. The Nurses there will be happy to tell you who needs visitors and which Vets need their privacy. Visiting a retirement home for Veterans is also a welcomed visit and does alot more for any Vet than a single lightbulb. A group of people in my area got together and got a donation from a car dealership to be able to get a van and drive Veterans to their doctors appointments at the nearest, but very difficult to get to, VA. There are a number of ways we can help our local vets by helping with meals, appointments, or just rides to church or other events. Give your money to a charity that actually does something for our Veterans. Not all charities are created equal and not all charities get the money to the people who really need it or to those who it is promised. If you want to check out if a charity is reputable check out Charity Navigator. It's easy to donate your car to this organization. We did! I'd be happy to share my experience with anyone wanting to know more about this. There are lots of other great charities that really provide wonderful, and direct, assistance to our Vets. 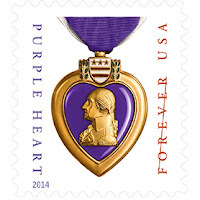 If you just want to show your support without actually doing anything buy the Purple Heart stamps for your snail mail instead of changing a lightbulb on your front porch. This Veterans day don't just buy in to a platitude that really doesn't do anything for our Vets. They stepped up to the line when they were needed. Now it's our turn. Take Action don't just switch on a lightbulb. Please do not change the lightbulb on your front porch but instead find another way to let our Vets know we care. Please. Placing an American Flag out on your front porch is a much better way to show our Vets you care. For me, I will be boycotting Wal-Mart and honoring our Vets in ways that actually will help them.